The swings in stocks and futures are pretty volatile these days. 30-50pt swings on the Dow Jones in a few minutes time. 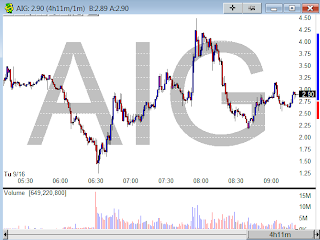 Rumors come out during the day and you see stocks like AIG pop a dollar, only to see the move get faded over the next 30min. You cannot be married to a position for long in this market.